Tandem cyclizations that result in rapid formation of complex molecular skeletons have always attracted my attention, especially when fairly unusual intermediates are implicated in the corresponding reactions. Below you see a really cool sequence recently reported by Jennifer Stockdill of Wayne State University. 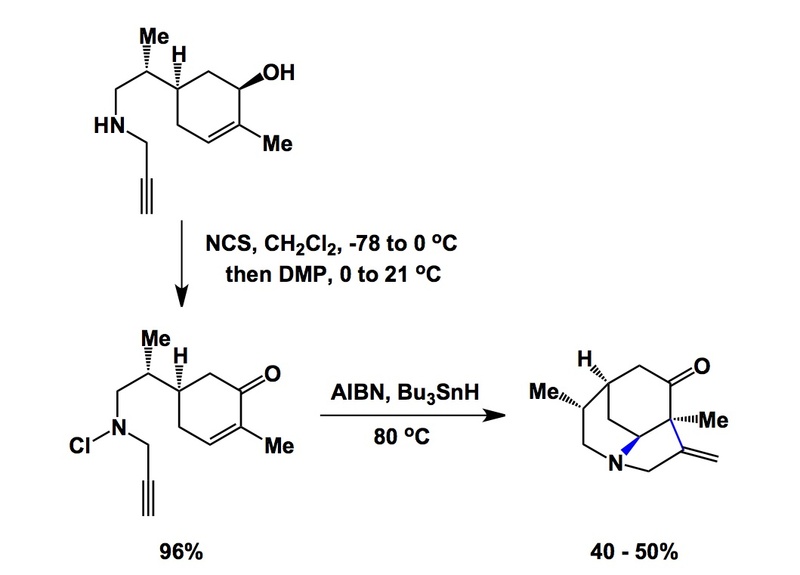 The reaction targets the tricyclic system of daphniyunnine (what a mouthful…). The first step is N-chlorination, which is achieved by the use of NCS (N-chlorosuccinimide). N-chloroamines are interesting synthetic intermediates that can get tantalizingly close to losing the elements of HCl upon treatment with base, yet are often surprisingly stable and isolable. Upon alcohol oxidation in the example below, the tricyclic system is set up by way of a tandem radical cyclization, which starts off the aminyl radical. The authors highlight the neutral nature of the aminyl radical undergoing 6-exo cyclization in their sequence. It will be interesting to see a completed synthesis (hopefully some time soon).